The islands emerge through the crystal emerald water , with scattered tiny villages , some of which seem white like little birds nested on the slopes of hills covered with forests of olive and cypress trees. The local people, warm and friendly, are always ready to welcome visitors with the traditional Greek warmth . History is present all over the area . During the era of Homer , Corfu was famous for the sailing skills of its people. Corfu's emblem is the Rudderless ship , guided by sails and oars. Since the Corinthian era ( 8th century BC), Corfu became famous for its powerful fleet . Today, Greece has the biggest yachting fleet in the Mediterranean, based on century-old tradition . Northern Ionian sea differs from the other Greek seas. In spring and autumn , the temperature is similar to a sunny summer day in Northern Europe . The summer is even warmer, but the sea breeze makes sure that, even during the hot summer months, you will feel comfortable . A strong northern wind that blows in the Aegean Sea in the end of summer, is unknown here in the Ionian sea . In the summer afternoons, a northwestern wind blows, especially at the eastern coasts, but it is rarely stringer than four degrees on the Beaufort scale. Winds differ from one island to another, even from one bay to the other, but usually they are just as strong as they should be to blow your sails. Occasionally the wind can be as strong as 5 or 6 degrees, which gives the experienced sailors the chance for exciting sailing, while the less experienced ones can relax in one of the numerous havens or protected bays . During the night the wind usually stops completely. In winter , blow south strong winds , often more than 8 degrees on the Beaufort scale , which can last for several days. Experienced navigators will appreciate the characteristics of southern winds, which blow the sails slowly, givng time for finding a safe haven . Corfu is famous for its mild climate (the local sailors call the sea « Sacred » or " Female ") and visitors, with or without their own yachts, can enjoy their holidays. The Diapontian isles (Mathraki, Erikousa , Othoni) are located northwestern of Corfu . Mathraki is surrounded by reefs and cliffs which make access a hard but unprecedented experience . The other two islands are always the first stop for sailing boats coming from the Adriatic Sea . Their shores are ideal for the lovers of wind nature. 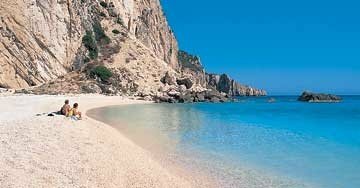 Along the coast of Corfu in the north , from Sidari to the cape of Agios Spyridon, the beaches are usually sandy and shallow , ideal for beginner swimmers and young children. The northeastern shore of Corfu is ideal for sea trips , offers an easy access and has got calm, warm water. The western coast of the island is the most controversial . The northern part has got many difficult capes, ideal for scuba-diving . More to the south , the scenery becomes milder, with endless sandy beaches , and a blue-green sea with trees which come down to the water. Surfers can enjoy their favourite sport on one of these beaches. At the eastern coast to the south of Corfu town, the beaches are more uniform with warm, shallow water ideal for children and beginner swimmers. The pretty islands Paxos and AntiPaxos are famous destinations and their ports Lakka, Gaios, Loggos and Mongonissi are full of yachts during the summer. The western coast of the islands is characterized by impressive steep cliffs with sea caves , which you can visit . Even if AntiPaxos don't have a safe haven, the beautiful beaches with the spectacular crystal turquoise water of the northeastern coast are really popular . Sailing competitions in Corfu .